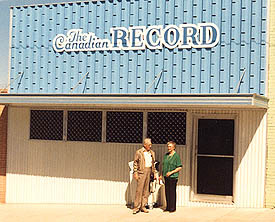 The Canadian Record is a weekly paper published in Canadian, Texas. 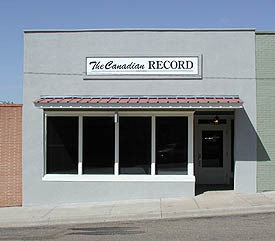 The front of the newspaper building was slipcovered in the early '70's. The owners became dissatisfied with the building's function and appearance in the '90's. The corrugated metal front was dated and unattractive, the windows leaked air, the sun screen created an impenetrable impression, rainwater was undermining the building's foundation, and people sometimes stumbled on the entry door's small step. The slipcover was removed. The entryway was recessed and rebuilt. New windows were framed and insulated glass was installed.The brickwork found behind the metal slipcover was primitive and had been extensively damaged. Other visible walls of the building had been plastered years before, so the renovated building's front was also plastered. The new awning provides protection from the afternoon sun's intensity.